Blog Home > DIY and Home Improvement > Time to clear the decks! Summer is here, the timber decking however is probably still a little under the weather with the constant monsoons we have been enduring. Time for a clean up befor the BBQ comes out and the Pimms gets decanted…………..Or whatever it is you do with a mixture of alcohol and vegetables! The first thing to do when cleaning a timber deck is to wash it down thoroughly and this is best done with a power washer. If you don’t own a power washer you can hire one for the day (or even sometimes for half a day) from your local tool hire shop. Follow the DIY Doctor project on using a power washer to get the best results from your cleaning. Having washed the deck down you can apply any number of products to enhance and preserve it. Our personal favourite is shown in the image above (Click on this image if you would like to buy some) and gets right into the grain bringing out the beauty of the wood as close to the original condition as age will allow. 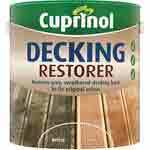 You can also colour the deck if it is a little faded and our recommendation for this is the range of colours from Cuprinol which stain, rather than paint, the deck. The difference being that stain soaks into the grain to give the timber it’s ,colour while paint, although soaking in a little, does so purely for adhesion to the surface. The colour element sits on the top of the timber. Again, click on the image if you would like to buy the stain. Timber decks fade almost without our knowing and when we have spent a day restoring them it is always amazing to see how faded and grimy they had become. A rejuvenated deck will help you enjoy those lovely summer afternoons and evenings even more. 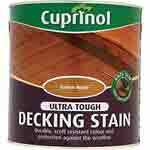 For more information see our project on How to Stain Decking. Builders Bums – a vertical smile?